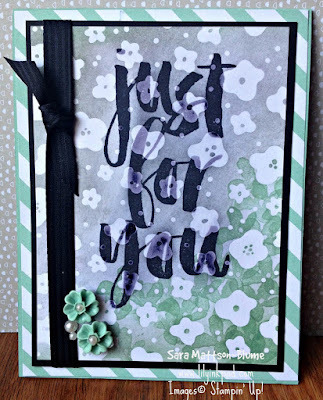 I hope you enjoyed the Stampin' Addicts Sale-a-bration Blog Hop. Sale-a-bration starts on January 5th, so get your orders ready! 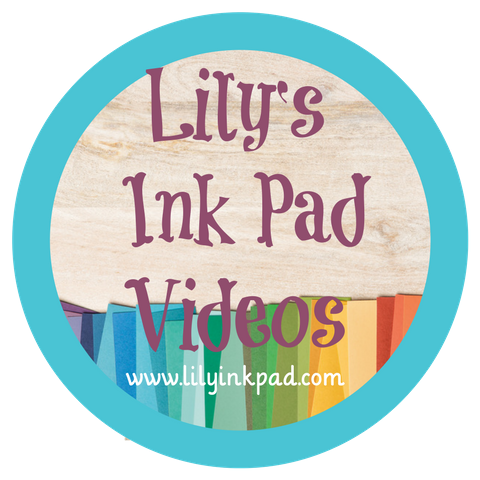 If you need a catalog, email me a lilyinkpad@yahoo.com and I'll send you one. 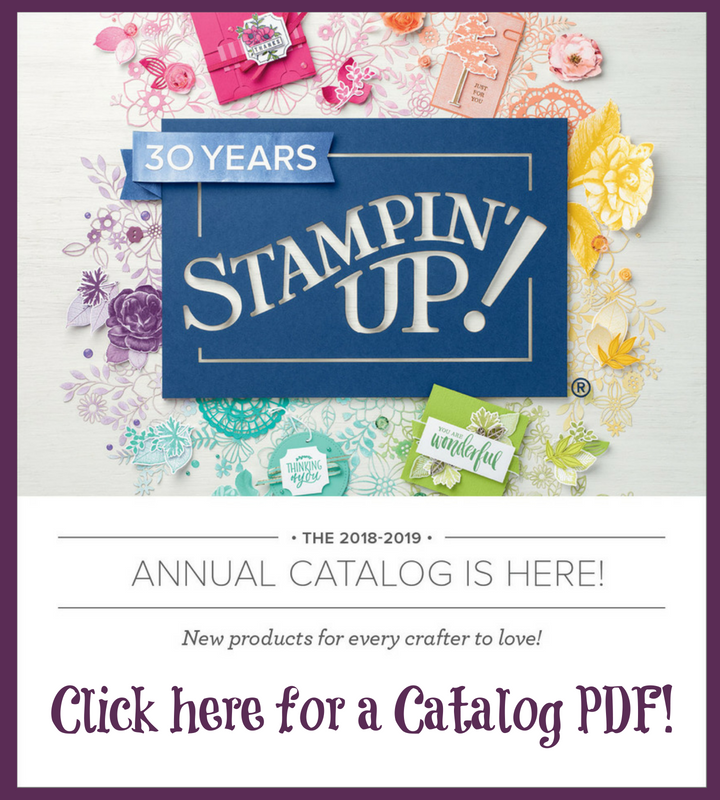 As soon as the catalogs go live, I will get a link here on my blog. Until then, here are some more details on the two cards I shared. The Archival Black didn't wipe off of the embossed sections entirely, yet didn't fully stay on, but I like the effect of "shading." If I would have used another color ink that was dye based, the ink would have rubbed right off as it did where I sponged Mint Macaron and Smokey Slate. I also stamped some flowers from this set to look like leaves in Mint Macaron behind the bottom flowers. 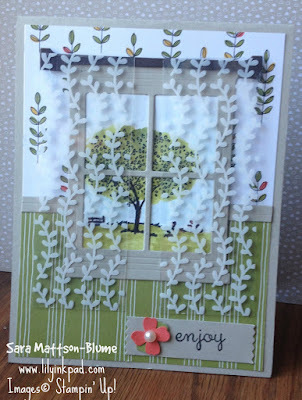 I decided the card needed a layer of fun, so added a background from the It's my Party Designer Series Paper Stack (available in the Occasions Catalog after January 5th). I used my Fine Tip Glue pen to add some pearls to the center of the In Color Blossom Accents. If you look closely, you'll see I made my own curtain rod from the long edge of an Early Espresso Window cut out by the Framelit and trimmed with my Paper Snips. I also added a chair rail. If you look very closely you can see a little score line in the middle. To make my chair rail, I cut a second window frame apart. 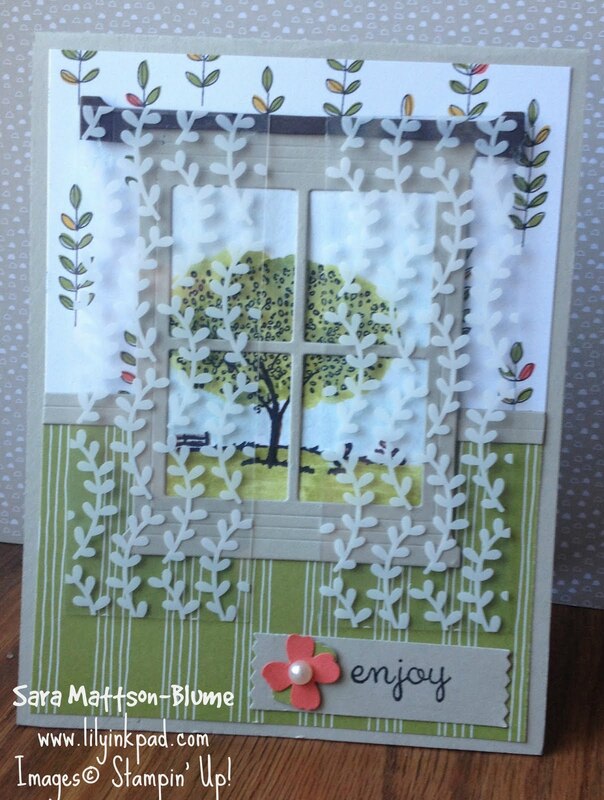 I used an aquapainter with Mellow Moss and Old Olive on the tree and grass and Soft Sky for the sky. 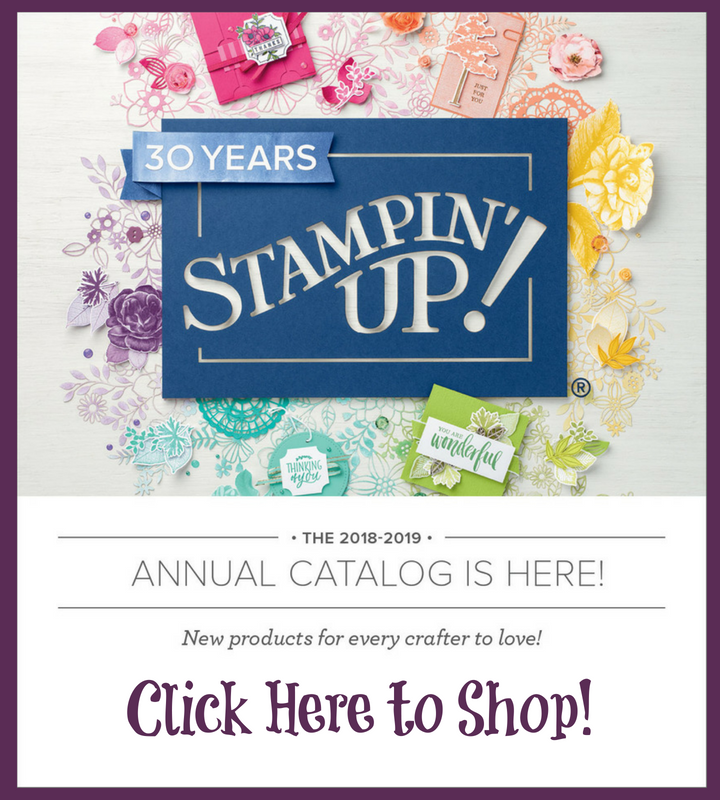 The wallpaper and paneling came from the Wildflower Fields Designer Series Paper, which is one of the Sale-a-bration products you can get for FREE with a $50 order.